Instead of writing one race report I decided to report on the year of racing instead. It all started in early February with the Sedona Marathon. Over 2000 participants in the 5K, 10K, 1/2, and full marathon. Since my training was only shorter distance up until then I decided to race the 5K on the day before the race. 700+ people in this race. They announced that it would be a gun start and a chip finish, meaning if you wanted to be on the podium you had better get to the extreme front. Just before the start a man with two children 5-ish pushed his way to the front line, so did a very overweight woman. The gun went off and both kids went down within 10 seconds, and I heard the woman scream loudly “don’t push”. Basically a down hill first 3/4 mile, around a very hilly neighborhood and 3/4 back up hill. Within a few minutes we were in the 1/2 marathon group that had started 3 minutes before us. At the first turnaround we turned to face the street wall to wall with very slow runners. I followed some of the fast kids through. Very weird race, I thought for a while I must be in the wrong race because I could not see anyone in front of me or in back of me over 15. At the finish there was only one person over 15 besides me for a long time. Age Group 1st, 20th overall. Lake Havasu Tri in late March. It was Spring Break time and the smell of gasoline filled the air. Interesting parts were two transition runs in bare feet of 100 yds. of crushed rock, very steep hilly bike, and a run with a three flight staircase. Age Group 1st, 9th overall out of 600? Mesa Tri in Phoenix. Early May, 50 meter pool swim, very fun, extreme fast bike, and a flat run, Age Group 1st, 2nd overall out of 200. Santa Fe Century 100 mile bike ride, late May. Was beautiful weather. Fun with my bike group from Sedona. 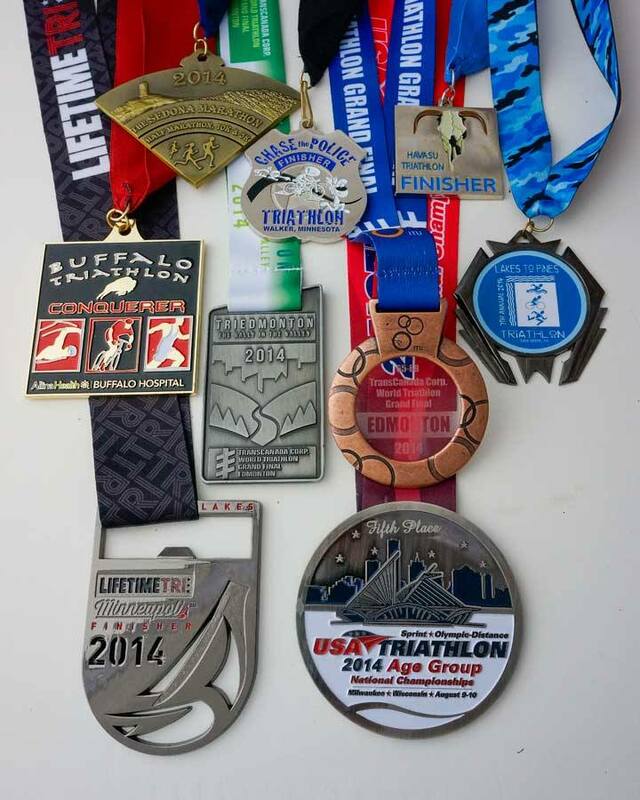 Buffalo Triathlon. The Olympic distance is what I would be focusing on this season with both Nationals and Worlds coming up later in this season. I wanted to do well here. There are just too many people in this race. It is hard to stay legal, not drafting, blocking, or going over the center line. Was a good run and ended with a 1st Age Group win 56th overall. Lakes to Pines Tri. Most of you remember. Cold and rainy. Matt made this a good race for me. Even though I didn’t catch him on the run, it was still fun. Age Group 1st, 3rd overall 1 min. back. Life Time Fitness, Olympic dist. again. There was a banner and person leading each age group to the start. I was the only one in my age group and it was kind of weird. No need to race hard I will win my age group and I had no chance to do well overall, frustrating. Good swim, Long transition, the bike was so rough I had to come off the aerobars I was bouncing so hard. We were splashing through puddles and grass on the run and it was hard and slow. Chase the Police in Walker was just because I need a race two weeks before Nationals. I had never done this race before and it was fun. The run is a challenge being up hill to the turnaround. With an Age Group 1st and setting a age group record by 14 minutes I was pleased. My second under 7:00 pace on the run this year I thought I could hold a good pace for Nationals Olympic dist. USAT Nationals in Milwaukee. The swim exit had changed and made a longer T1, but I had liked the bike and the run from last year. I really do like this course and had last year to grow on. I was ready. Swim: Was faster and easier than last year. I had paid closer attention to how the buoys were placed. Cutting close to the shoreline and not the buoys is the best route here. T1- longer than last year but flat so it went by fast. Bike: It felt good but it was slower than last year. I don’t know why, just was. T2 Went well and was out on the run fast. Something in the lead up to this race had gone wrong or maybe it was just the day. 2:25:44, my slowest Olympic dist in two years. I was disappointed, I should have easily taken two minutes off the run and one off the bike. Age Group 5th still in the metals. Three weeks to the Worlds in Edmonton. I put myself on a crash speed work diet of fast 800’s to 1 mi’s. I knew I wouldn’t be able to change my run speed that much but I also knew I didn’t need to. It has been there just a few weeks ago. My goal was to change my mental attitude about going fast. I needed to feel going fast was easier than in this past race. It was working. World Triathlon Grand Final, Edmonton. 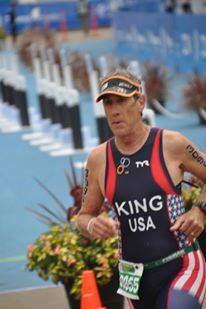 I drove there and arrived just in time for Craig Peterson’s Aquathlon Worlds on Wed. It was exciting and fun to be at a world event again. The swim was in a man made lake that had been chlorinated for these races. 750 meters and a 5K run for Craig. He did well with Lisa as his official sherpa. I still had 5 days to go before my race on Monday. Christel arrived on Thursday and we did all the necessary events and meetings, all over town. Monday Sept 1 2014, Race Day. Cold in the morning and the transition closed at 7:30, my race started at about 9:00. Craig and Lisa were there to help both, Christel and I, get things organized and carry our clothing bags. Swim: Good start with all men over 65 in my wave. The first lap I was almost 2 min faster than in my two practice sessions earlier in the week. I came out of the water in a good place I think Christel yelled at me, 5th place. Bike: I knew was very hilly, 1/2 mile at 8-10% grade, 7/8 mile climb at 5-6% and two more climbs, all done twice. 38 mph going down and 9 mph up. I do a lot of this in Sedona but that was 4 months ago. I stayed within myself here and it was hard but fun. T2- Very long. +3 min again. Run: Was about 3/4 on a dirt path. I knew it wasn’t going to be fast but I had run it twice during the week and I had liked it. I had a slower than on tar but good pace going. After the first two miles saw about 200 yds in front of me the person who has won Nationals. I was slowly catching him. At the turnaround it was confusing some were going to the finish line some were going on. After getting back out on the course I noticed the age group winner at Nationals was no where to be seen. Even though I slowed a bit the second lap I was holding a good pace. I had passed two runners in my age group that I had seen. Blessed finish, Blue carpet, spectators yelling, carrying a USA flag I had been handed, I felt good. Post race: The winners run time in our age group was 22:30 a new world any age record. Right. He had not gone around the second lap. I put in a protest and in the end I came in Age Group 3rd and very proud of it. ← Winter / Spring Swim Clinics are coming!